When chocolate was used on my first birthday to get me to take my first steps, the foundation of a lifelong love affair was solidly built. But it took another 30 years before I was able to appreciate the deep flavour of dark chocolate. Even so, I still prefer dark chocolatey food to have a balancing, white counterpart. Clearly, I’m not the only one because Oreos are based on the exact same principle. 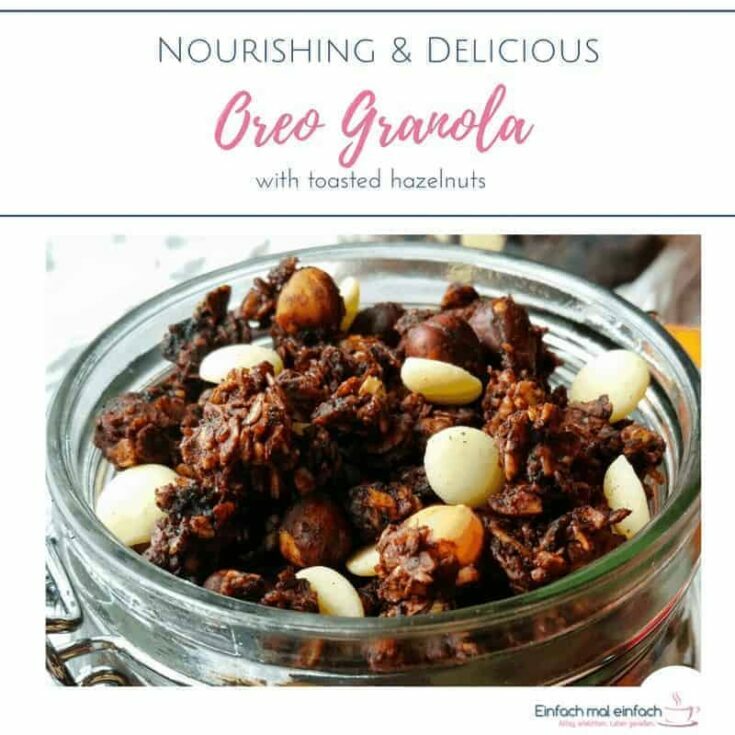 So in this article, I’m going to show you how you can combine the flavours of dark and white chocolate into a delightful granola that is perfect for breakfast and snacks alike. I love granola as a quick and easy breakfast option. Unfortunately, I find most commercially available granolas far too sweet for my taste so I have got to make my own. 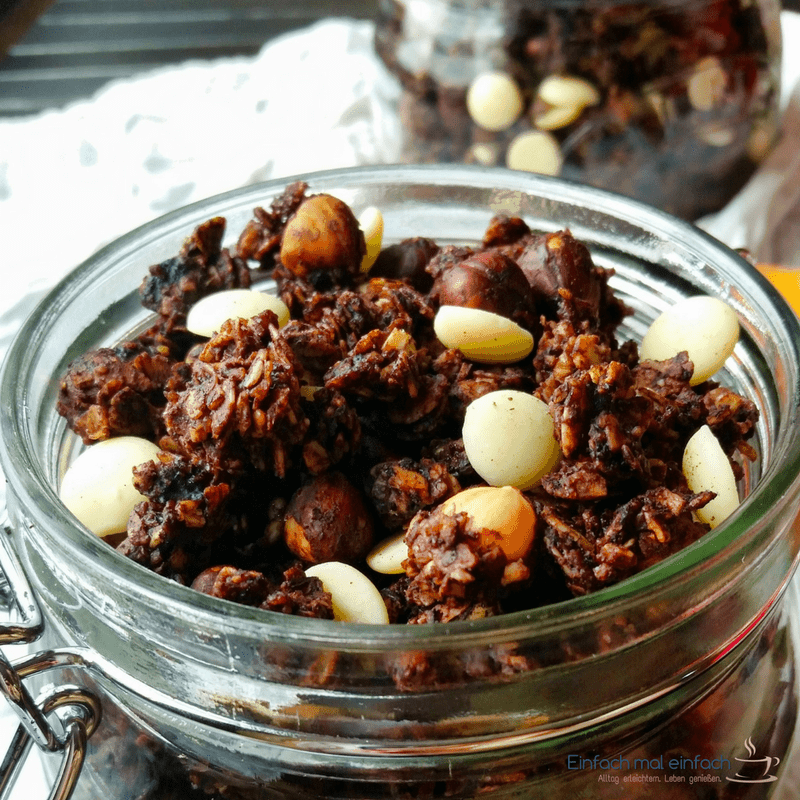 When I came across a recipe for chocolate granola a few years back, it was not only far too dark-chocolatey but also not sweet enough. Shocking, I know. So I modified the recipe until I found something that, at least for us, strikes just the right balance between rich chocolate flavour and pleasant sweetness without either being too dominating. This granola is so easy to make that you won’t mind how quickly it’s gone once you introduced your family to it. It doesn’t require any experience in the kitchen so it’s also perfect if you are just starting out making your own granola (or anything, really). And it’s a great little gift for everyone with a soft spot for chocolate, granola, breakfast, or all things oreo. I’m not the biggest fan of chocolatey breakfasts but this granola is so much more than a breakfast. 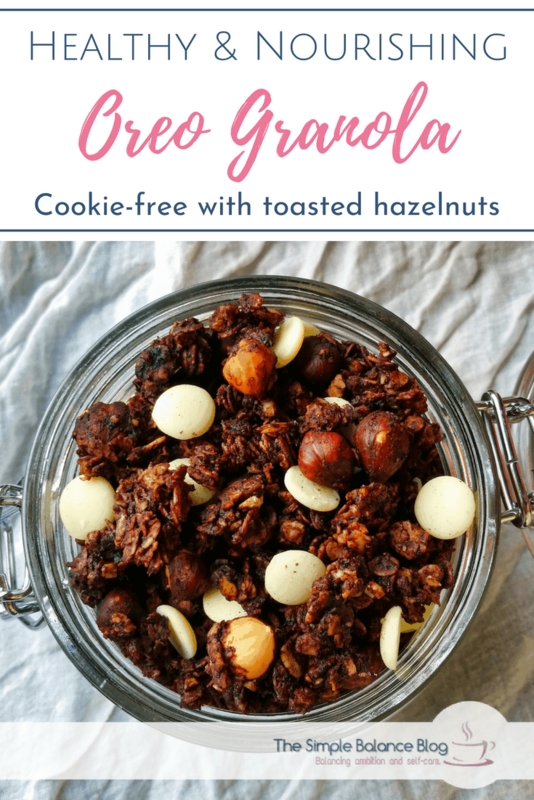 Packed with nutrients coming from oats, nuts, and coconut oil, it also doubles as a satisfying afternoon snack – which can be glutenfree, I might add, if you use glutenfree oats.. I love it most on plain full-fat yoghurt or with some milk but when the use of those would complicate life too much, it’s just as great eaten by itself. Of course, if you love to start your day on a decadent chocolate note, this is what you want to keep on hand. You will be particularly thrilled with this breakfast choice if you love the milk in your cereal bowl to turn into cocoa. Before I present the recipe, let me quickly share a couple of options how you can modify this granola according to your tastes. Half the amount of brown sugar, if you find it too sweet – or add another tablespoon if you have a sweet tooth. For a deeper chocolate flavour, sprinkle your granola with a 1/2 cup dark chocolate chips as soon as it comes out of the oven. Allow them to melt before you break up the big chunks of granola and stir to get the chocolate evenly distributed. Feel free to omit the hazelnuts if you’re not a fan. 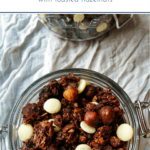 But I do recommend you try it as is at least once – you might be surprised about the lovely flavour these roasted hazelnuts add to it. So, get a bowl and gather your ingredients. You won’t regret giving this a shot! And please leave a comment to let me know you made it or share your variations of this recipe. 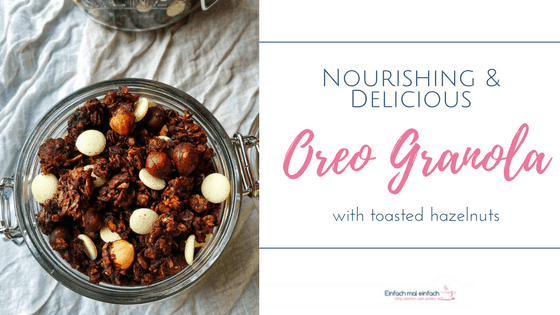 Looking to combine a nutrient dense breakfast with the decadence of chocolate or your favourite Oreo cookies? This granola is quick and easy to make and checks all those boxes perfectly. Preheat oven to 250°F/130°C and line a large baking tray with parchment paper. Add oats, brown sugar, cocoa powder, slivered and ground almonds, and salt. Mix and add hazelnuts. In a liquid measuring cup, melt the coconut oil if solid and add the maple syrup and vanilla extract. Stir to combine and pour over dry ingredients. Mix thoroughly until no dry patches remain. Distribute evenly on baking tray and bake in the 250°F/130°C oven for 75 minutes (1 hour 15 minutes). If you prefer your granola with smaller chunks, stir it halfway through baking.